Cruel and Usual Punishment is a wake up call to the Western world. ^^Nonie Darwish presents an insider's look at Sharia and examines how radical Muslim laws are destroying the Western world from within. Living under Sharia law for the first thirty years of her life,a virtual slave to Islamic law, Darwish never questioned or challenged her rights - or dared to even think about the validity of Sharia laws. She didn't try to examine what Sharia was, how it came about or why she followed it. "This is Allah's law," she was told, and she knew what awaited those who questioned Allah's law. ^^But she doesn't believe the lies anymore, and now she wants to share her experiences with the Western world. 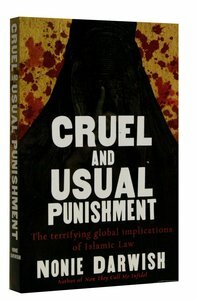 Cruel and Usual Punishment is an insider's look at how Muslims sacrifice their basic human rights to obey the archaic and brutal laws handed down to their prophet centuries ago. ^^Heed this warning: Sharia Law is attempting to infiltrate Western culture and destroy democracy. Nonie Darwish lived for thirty years in a majority Muslim nation. Everything about her life?family, sexuality, hygiene, business, banking, contracts, economics, politics, social issues, everything?was dictated by the Islamic law code known as Sharia. Think it can't happen? In 2008, England?once the seat of Western liberty and now the home of many Muslim immigrants?declared that Sharia courts in Britain have the force of law. When Muslim populations reach as little as 1 or 2 percent, says Darwish, they begin making demands of the larger community, such as foot-level faucets for washing before praying in public schools, businesses, and airports. "Airports in Kansas City, Phoenix, and Indianapolis are among those who have already installed foot baths for Muslim cab drivers," writes Darwish. These demands test how far Westerners will go in accommodating the Muslim minority. How far will they push? The Organization of the Islamic Conference works to Islamize international human rights laws and apply Sharia "standards" for blasphemy to all nations. The penalty for blasphemy? Death. Weaving personal experience together with extensive documentation and research, Darwish exposes the facts and reveals the global threat posed by Sharia law. Anyone concerned about Western rights and liberties ignores her warning and analysis at their peril. About "Cruel and Usual Punishment: The Terrifying Global Implications of Sharia Law"
Nonie Darwish lectures across the United States and has appeared on radio and television programs including CNN, Headline News, Fox, MSNBC, Al-Arabiya, National Public Radio and Israeli TV. Darwish has been published in the London Telegraph, Jerusalem Post, and New York Daily News. She is a frequent lecturer on college campuses including Harvard, Brown, Stanford, UCLA, University of Pennsylvania, Georgetown, Boston University, and the University of Southern California. Her books include Cruel and Usual Punishment: The Terrifying Global Implications of Islamic Law and Now They Call Me Infidel: Why I Renounced Jihad for America, Israel, and the War on Terror. Customer Reviews For "Cruel and Usual Punishment: The Terrifying Global Implications of Sharia Law"
Noni Darwish writes powerfully about the dangers to the West that Sharia Law will bring. She knows firsthand of what she speaks, having lived her life for decades as a Muslim woman. This important book is a warning, and it is to be respected deeply because of the dangers that speaking out publicly against Sharia bring to any individual, especially a woman. This is a book that needs to be read and shared lest our people remain in ignorance until it is too late. Once read, we then need to pray for all of those living under Sharia that they might be set free from this tyrannical system.